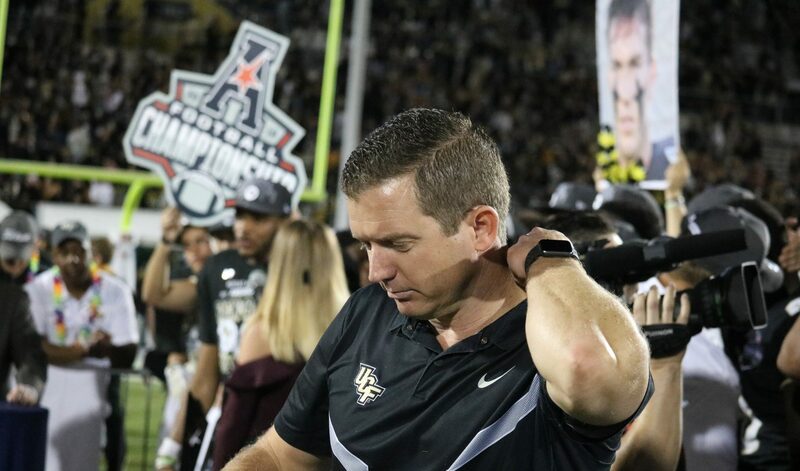 University of Central Florida Athletics Director Danny White went in front of the post-game press conference Saturday night to fight for the football program’s student-athletes to be included in the College Football Playoffs. UCF made a remarkable second-half comeback against the University of Memphis in the AAC Championship game to finish 56-41 at home. All with a backup quarterback, and the weight of 24-straight wins behind the one earned on Saturday. (White’s message begins at 15:15, 4 minutes left). “There has been a national conversation going on for the last 11 months since we won the Peach Bowl and claimed a national championship last year. I don’t feel – I’ve been pretty vocal about this – that the four-team playoff is adequate in the postseason of college football. I think last year’s team showed that” White said to media. When asked what the impediment to why UCF couldn’t be in the CFP, White said he couldn’t find one. The Knights defeated Auburn on the national stage at the Peach Bowl New Year’s Day in Atlanta to cap off an undefeated season. UCF continued that streak into 2018 and dominated No. 19 Cincinnati and finished off rival USF after star quarterback McKenzie Milton suffered a devasting injury. The No. 8 Knights (CFP) have little chance at jumping to the coveted fourth spot in the playoffs, even though one might argue that the three teams above them do not belong and that UCF was placed at No. 8 to ensure that no amount of chaos would lead to them making it to a semi-final game. Stay tuned with Knight News and our coverage of Selection Sunday.